Standin' On The Mountain, is a new Christian musical, which is being developed for public release. Music, Lyrics, and Book by Sharon Kay Chatwell. Arrangements and Orchestration by Nathan James Larsen. © Sharon Kay Chatwell 2004, 2018. All rights reserved. For over 30 years, I have been hearing these songs in my head and writing down the lyrics and music (as best I could, since I don't read music!) Not long after I had most of the songs written down, God gave me a play to put them all together. That's how Standin' On The Mountain came to be! Now we hope to prepare the play, with all of its songs, so it is ready for the stage! I want to thank everyone for their help and encouragement! To keep up with the latest on the play, visit us at our Facebook page. Please pray for us as we continue working on Standing On The Mountain. I believe it will be a blessing to others, as it has been a blessing to me. Enjoy this preview video of the play! We are currently seeking a venue for the first full production of the musical. If you know of a large church or a Christian college with a Theater Arts Department, please let them know about this opportunity! They can contact me through the Contact Us page. Standin' on the Mountain from Sharon Kay Chatwell. I hope you will enjoy this additional video of a private screening of several original songs from Standin' on the Mountain. To view the video in Full Screen Mode, click on the Full Screen emblem on the Lower Right-Hand corner of the video screen. Please note that you will not be able to download the video or to share it on other websites. You will see 8 different songs from the musical showcased here. Before each one there is a bit of information as to how it fits in with the story. If you would like to sample the songs, you can find their beginnings at these points. Standin' On The Mountain is a powerful story about a church in the future that experiences persecution and emerges as the Church Triumphant. The Pastor and Ruth Ann help a young woman named Sylva, who comes to saving faith in Christ and goes on to carry the message of the Gospel to others. Through it all you see the heart and the humor of all those involved, as the Church waits expectantly for the return of Christ. A faith-believing man, about 50. The Pastor of First Church. A jolly old soul with an attitude and a humble story to tell. The Choir Director at First Church, about 50. A young woman, seeking and finding. Danehart’s fiancée. A young man, foolishly involved with an evil organization, called "The People." An older man. The local representative of "The People." The quintessential deacon, and the Pastor’s friend. Two old church members, who finish each other’s sentences. Other members of First Church. Why did you choose the name, "Standin' On The Mountain"? The musical tells the story of various people who have to decide if they are going to trust in what Jesus said or not. When they do what Jesus says, they are seen to be wise. When they don't, they are revealed as foolish. So, at first, I considered calling the story, "Standin' On The Rock," meaning the solid rock foundation of Jesus Christ. Why did I change the name? The song goes on to say that Abraham was "Standin' on the Mountain" meaning that by faith Abraham was standing firm on God's Word and His Promises to him. Just like we, by faith, are to accept what Jesus did for us on Mt. Calvary and stand firm on His Words and Promises to us. 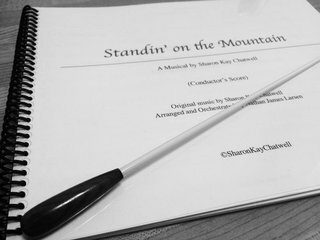 So, in the end, I opted to call the musical after its title song, and that's where I got the name: Standin' On The Mountain. I would very much like to have your feedback. Please feel free to leave your thoughts in the submission form located here. Particularly, I would like to know if you think the music honors God. Also, please let me know if you have a favorite song, and which one it is. The screening was done so that we could hear the songs played through for the first time. So exciting! Thank you for your input! God bless you! As you will see from the video, this has been a long process. God gave me these songs and I've written them down as best I can, especially since I don't read music very well, or play an instrument. I would also like to thank the musicians and vocal artists who participated in the Screening. You will find all of their names listed in the credits at the end of the video. And, of course, I want to thank my family and friends; especially my children and my husband, Rick, who have all believed in this project and encouraged me every step of the way. I have often asked myself, "Why me?" If God was going to give this music and the story to someone, why did He choose me? The answer, of course, is that I don't know. It occurs to me that if God can bring music to the world through me, with as few gifts as I have in that area, He can do anything through anyone. I believe the fact that He has used me is a great testimony to His power. Whatever the reason, I appreciate it. These songs have encouraged and comforted me for many years. And now I hope, by sharing them with others, that they will encourage and comfort them as well.